This comprehensive case study chronicles the four decade history of Chicago's Wentworth Gardens public housing residents' grassroots activism. It explores why and how the African-American women residents creatively and effectively engaged in organizing efforts to resist increasing government disinvestment in public housing and the threat of demolition. 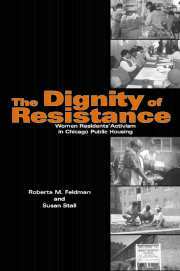 Through the inspirational voices of the activists, Roberta Feldman and Susan Stall challenge portrayals of public housing residents as passive and alienated victims of despair. Foreword Sheila Radford-Hill; Preface and acknowledgments; Part I. Introduction: 1. Struggle for homeplace; Part II. Wentworth Gardens' Historic Context: 2. US public housing policies: Wentworth Gardens' historic backdrop; 3. Memory of a better past, reality of the present: the impetus for resident activism; Part III. Everyday Resistance in the Expanded Private Sphere: 4. The community household: the foundation of everyday resistance; 5. The local advisory council (LAC): a site of women-centered organizing; 6. Women-centered leadership: a case study; 7. The appropriation of homeplace: organizing for the spatial resources to sustain everyday life; Part IV. Transgressive Resistance in the Public Sphere: 8. The White Sox Battle: protest and betrayal; 9. Linking legal action and economic development: tensions and strains; 10. Becoming resident managers: a bureaucratic quagmire; Part V. Conclusions: 11. Resistance in context; Epilogue; Appendices; References; Index.